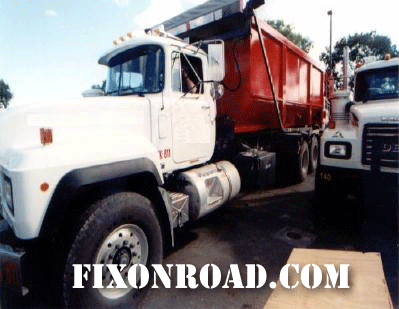 FixonRoad.com™ offers a comprehensive list of Truck Repair Services. 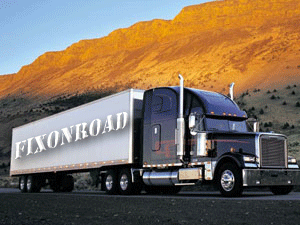 FixonRoad.com™ provides the latest information in the trucking industry. The finest in high-tech safety enforcement tools is being tested at the Federal Motor Carrier Safety Administration agency’s Roadside Technology Corridor along Interstate 81 in Greene County, Tennessee. Prototype truck inspection technology will be on display with an emphasis on the improvement of on-road commercial trucks and buses. The Wireless Roadside Inspection (WRI) Program has the capability to inspect trucks and buses at a fixed location of using a mobile vehicle. The Smart Infrared Inspection System features the ability to detect problems in commercial truck brakes, truck wheel and truck tires. The WRI program examines the condition of the truck through the assessment of on-board data collection. It can also be used along side mobile enforcement vehicles to help police determine trucks that need to be pulled over for safety inspection. The Smart Infrared Inspection System (SIRIS) is a prototype system that can scan both sides of trucks that pass for brake problems, wheel bearing issues and tire issues. 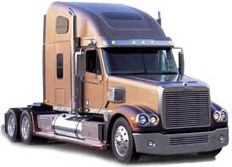 This technology is based on heat and temperature of truck components. Truck fires may or may not be more prevalent today, but they are surely catastrophic when they occur. In the old days, when trucks would catch fire, it was usually nothing more than burning up some wires of paint before a fire extinguisher would be used to put out the flames. Nowadays, trucks are made of all sorts of composite materials that truck fires spread more quickly and are more difficult to put out. 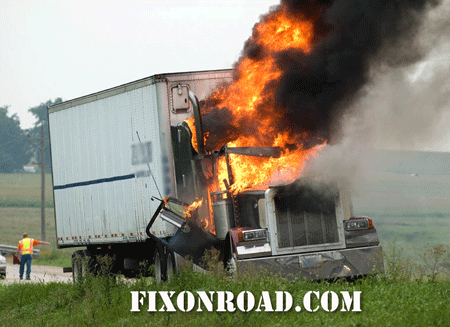 Today’s truck parts are more flammable – especially cab and sleeper trim – that fires can be extremely dangerous. Truck repair costs for fire damage have also increased. Truck damages can range in the neighborhood of $100,000 to repair a fire ravaged truck. Extremely hot fires can even melt the truck tires down to the ground! 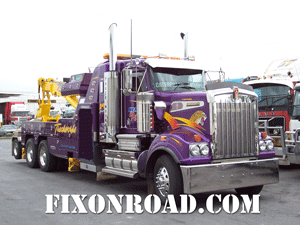 The perception in the trucking industry is that truck fires are almost always started by electrical problems. Quite simply, shorts overheat locally and then spread to flammable truck materials. While electrical issues are often the culprit when it comes to truck fires, issues with truck wheel ends are also a major cause. Dragging truck brakes, truck wheel bearing failures and turbo failures can also ignite fires. Another cause of truck fires are the cargo. Truck cargo that shifts, is not assembled properly or that is incompatible is also a potential cause for fire. 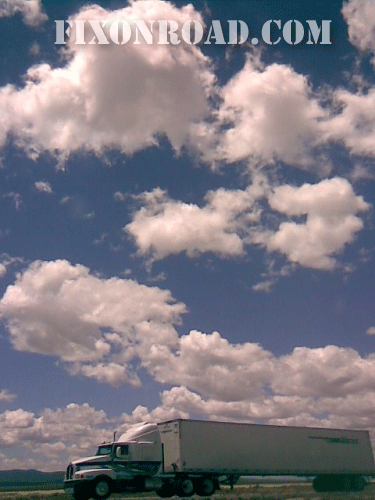 Truck Dealers and those in the truck repair industry just got some good news! Congress is planning to repeal the 12% federal excise tax on heavy trucks & trailers. It may be replaced with a 7.3-cents-per-gallon diesel tax increase. The Heavy Truck Fairness Act supports that idea that new trucks have significant environmental and safety advantages. This should move Congress to reduce the current barriers to new truck acquisition. The bill should work to stimulate financial investments in related truck technologies. In addition to taxing trucks, tractors and trailers – there will also be revisions to safety technologies such as truck rollover prevention systems and truck forward collision and lane departure warning systems. 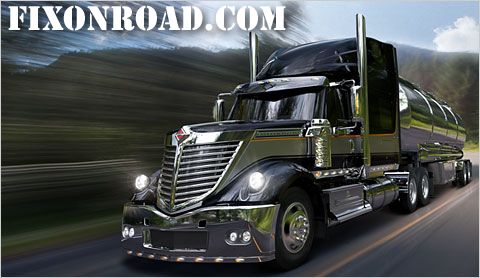 The latest tractor trailers, heavy haulers, freightliners, low boys, reefers and semi trucks are designed to increase fuel efficiency and reduce emissions. 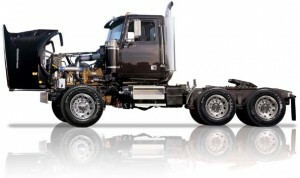 This improved truck technology also would be present in trailer aerodynamics and lighter-weight tractors and trailers. The Obama administration maintains that it is for legislation that will help the trucking industry, and has taken a stance against any increases in the fuel tax. 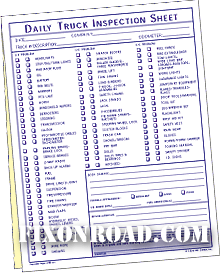 When it comes to truck tire service, FixonRoad.com™ gives our visitors access to the most comprehensive list of Truck Repair service providers around. 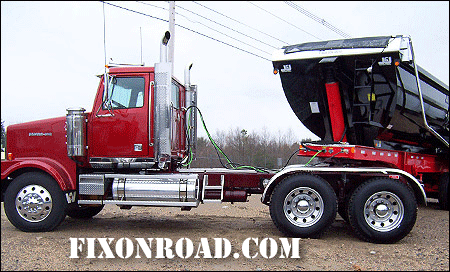 Our Truck Repair and Road Service providers specialize in: Mobile Repair Service, Truck Repair Towing, Mobile Trailer Service, Trailer Repair, Truck Stops with Repair, Mobile Tire Service, Truck Tire Sales and Tire Service, Quick Lube, Mobile Bus Service, Bus Repair, Truck Air Conditioning, Mobile RV Service, RV Repairs and Service , Mobile Bus Service, Bus Repair, Truck Glass Repair, Mobile Refrigeration Service, Reefer Repair and Service, Liftgates, Mobile Hydraulics Service, Truck Body Shops, Truck Parts, Load Shifts and Transfers, Truck Welding Frame, Truck Alignment and Truck Suspension.